The projected number one free agent starter for next offseason is off the market. The Cardinals officially signed righty Adam Wainwright to a five-year, $97.5MM extension that covers the 2014-2018 seasons and includes a no-trade clause. 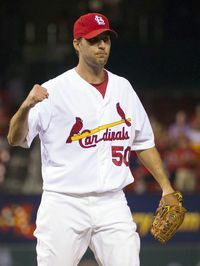 Wainwright, 31, is represented by Steve Hammond of Aegis Sports Management. He was set to enter free agency next year as the top pitcher available on MLBTR's Tim Dierkes's 2014 Free Agent Power Rankings. "I can't wait to make you proud of this contract," Wainwright told Cardinals chairman Bill DeWitt, Jr. during his press conference today, according to Derrick Goold of the St. Louis Post-Dispatch. The Cards were reportedly working on an extension with their All-Star hurler at various points throughout the spring, with both team and player reportedly preferring to leave Florida with a new deal in place. Wainwright's new deal falls short of the six-year, $127.5MM extension signed by Matt Cain with the Giants a year ago as well as Zack Greinke's six-year, $147MM deal with the Dodgers achieved in free agency. Aside from the shorter term, Wainwright's average annual value of $19.5MM is short of Cain ($21.25MM) and Greinke ($24.5MM). One potential reason for the difference in the extended pitchers: Wainwright's extension begins with his age 31 season, while Cain's began with his age 27 campaign. It should be noted that with Cain's deal, it was actually five years and $112.5MM in new money, since he was already under contract for 2012. Greinke's contract, of course, was signed after open bidding. Wainwright notched a 3.94 ERA, including 8.3 K/9 and 2.4 BB/9, over 198 2/3 innings with the Cards in his first season back from Tommy John surgery. He posted a 3.51 ERA from May 6th onward. As Rosenthal notes in his full article discussing the extension, Wainwright has pitched to a career 3.15 ERA in the majors. He began his big league career as a successful reliever in '06. In March 2008, Wainwright inked a four-year, $15MM extension with the Cardinals, and the team chose to exercise a dual club option covering the 2012 and '13 seasons. With the contracts of Chris Carpenter and Jake Westbrook set to expire after this season, Wainwright will be the elder statesman of the rotation. He's signed through 2018, and Jaime Garcia potentially through 2017. Lance Lynn is under team control through 2017, and promising youngsters such as Shelby Miller and Trevor Rosenthal through 2018. Well-regarded prospects Carlos Martinez and Michael Wacha are also waiting in the wings. As Dierkes' power rankings reflect, Josh Johnson is now the projected top free agent starter after this season, followed by Roy Halladay, Tim Lincecum, and Matt Garza. There's a lot of uncertainty in that bunch. Ken Rosenthal of FOX Sports first broke the story. Photo courtesy of USA Today Sports Images. Tim Dierkes contributed to this post.